The number of under-18s in the UK being prescribed weight-loss drugs rose 15-fold between 1999 and 2006, a study of data from GPs suggests. The University College London said its analysis indicated up to 1,300 children a year could be on treatments, even though they are not licensed for them. The figure compares with more than 1m adults who use the drugs. Obesity experts said the trend was worrying and called for a greater focus on promoting healthy lifestyles. Weight-loss pills work by either altering chemical messages to the brain that control feelings about food or by preventing fat absorption. They are licensed only for adults and so any GP prescribing them is doing it on an unlicensed basis - a practice that is not uncommon in the UK. Researchers analysed prescribing trends from the General Practice Research database, which covers 5% of the population. They found that the number of young people being prescribed one of three weight-loss drugs had risen from 0.006 per 1,000 to 0.091 per 1,000 from 1999 to 2006, the British Journal of Clinical Pharmacology reported. But most stopped taking them before they had any benefit, the researchers added. Russell Viner, one of the authors of the study, said: "It's possible that the drugs are being given inappropriately, or that they have excessive side-effects that make young people discontinue their use. "On the other hand, they could be expecting the drugs to deliver a miracle 'quick fix' and stop using them when sudden, rapid weight-loss does not occur." Tam Fry, of the National Obesity Forum, believes the use of the treatments will become more common after the move this year to allow chemists to sell the most popular drug, orlistat, over-the-counter. The treatment is sold under the brand name alli and is packaged in lower doses than the prescription version. Mr Fry added: "This rise in the use of drugs is a real indictment on society. "It seems to me that we are ignoring measures to prevent our children becoming obese and then turning to drugs as a treatment of choice when they should be a last resort. "That borders on criminal because it means that all the messages about healthy eating and exercise for reducing weight are just being tossed aside by GPs and primary care." Instead, he said, the obesity problem was to do with insufficient open spaces to play and exercise as well as the need for tougher regulation of the food industry. "It's the failure to regulate the energy in and the energy out. [Children] are failing to exercise enough to maintain the balance." 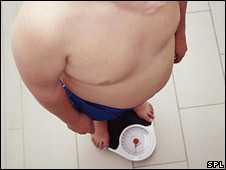 But Dr Jim Kennedy, a GP in Middlesex, said there could be valid reasons for youngsters getting the drugs, pointing out specialist obesity clinics were treating more and more children. "There are some children who are so severely obese that they need intervention to stop them developing long-term health problems. "These clinics have all sorts of safeguards and monitoring in place." A spokesman for the Department of Health said people should where possible try to lose weight through a healthy diet and exercise before medical treatment is considered. "However, for people who are obese and are not able to lose weight through diet and exercise alone anti-obesity medicines can help as part of an overall weight management programme."